Serendipity. Great word. It means a “fortunate happenstance” or “pleasant surprise.” It was coined by good ol’ Horace Walpole back in 1754. I’m sure you all knew that. Why serendipity? It helps explain this post. My last post was about leaving comments, which made me think of fortune cookies. Why? Because they contain little comments. So to speak. 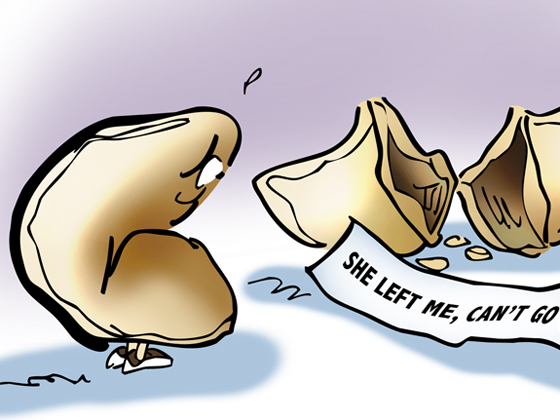 I scratched out a few fortune cookie gags, and decided to draw them up. 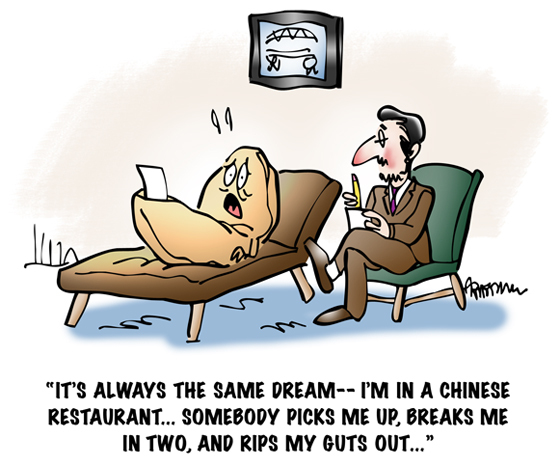 Did you hear about the fortune cookie with the recurring nightmare? An understandable neurosis. Here’s a closeup. I wondered if there were any fortune cookie sites. Silly me. There’s a site for everything these days. 1. The project on your mind will soon gain momentum. Not by itself it won’t. Thinking about projects becomes a substitute for starting them. Ask me, I know. 2. Beauty is simply beauty. Originality is magical. An essential truth, especially for an artist. Without a good idea, an original approach, even the most beautiful work won’t be compelling. 3. 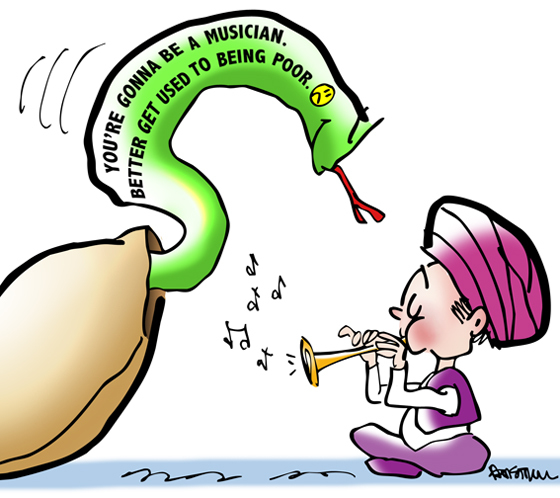 You don’t need talent to gain experience. You do need skills to succeed. But you don’t need fully-developed skills to begin. Jump in. Get experience. You’ll learn a lot as you go along. 4. Too many people volunteer to carry the stool when it’s time to move the piano. Ha! I usually volunteer to sit on the stool. Let’s face it: we only learn and grow when we take on significant challenges. Move the piano. 5. You are what you are; understand yourself before you react. We can’t “cure” a personality trait. But if we acknowledge a certain emotional tendency (a quick temper, for example), we can stay vigilant– and hopefully keep it from sabotaging us during a moment of crisis. 6. One of the best ways to persuade others is with your ears–by listening to them. So many of us just want to be heard. We’re more open to another’s point of view if they listen with full attention to ours. 7. Before the beginning of great brilliance, there must be chaos. Every artist knows this. I think it’s true for any great venture, any line of business. Change and creation are messy. Stay calm, press on. 8. The ultimate test of a relationship is to disagree but to hold hands. Also true for families and teams. We all need help. Disagreements are inevitable. Successful teams stick together despite disagreements. 9. People enjoy having you around. Appreciate this. Quick story: I once worked for an insurance company as a programmer-analyst. I was one of the lesser lights in the department. One day, feeling down, I told someone, “I don’t feel like I contribute very much.” The person (who wasn’t a close friend) said to me very seriously: “But you make people laugh– and that’s so important.” I was speechless. I can think of many people I enjoy having around. I bet you can, too. 10. The measure of time to your next goal is the measure of your discipline. File this one under Painful Truth. We know what we want, we (mostly) know what needs to be done. The missing ingredient is discipline. 11. When you can’t naturally feel upbeat it can sometimes help you to act as if you did. Easier said than done, but worth a try. There have been many studies which have concluded that acting a certain way can affect your mood. 12. Customer service is like taking a bath: you have to keep doing it. Ha! Also true for blogging. And social media. And marketing. And staying in touch. And keeping up with technology… Right. Pass the soap. 13. Isn’t there something else you should be working on right now? This one made me roar. Then I realized how true it was. We embrace distractions of all kinds– including, alas, social media and the internet. 14. You don’t get harmony when everyone sings the same note. And you don’t learn anything when everyone has the same opinion. Want to understand the value of diversity? Ask a fortune cookie. 15. Rarely do great beauty and great virtue dwell together as they do in you. 16. I am a fortune. You just broke my little house. Where will I live now? That one made me bust out laughing– and then I felt guilty for making someone homeless. I thought it was just a cookie. Who knew?? 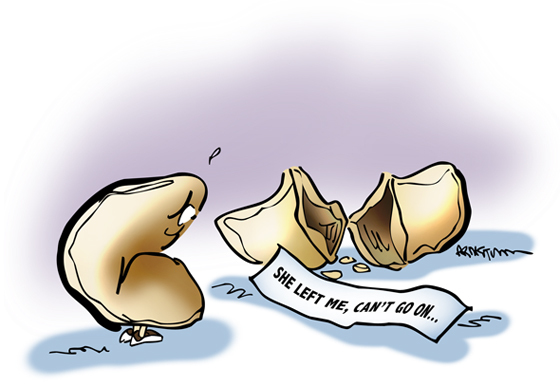 Which brings up a existential question: do fortune cookies have feelings? Are they cognizant beings?? Well… maybe so. Do you always crack open your fortune cookie and read the fortune? Do you ever actually eat the cookie?? Ever gotten a fortune that “spoke” to you, or came true? Care to share it? Has anyone ever gotten the fabled “Help! I’m being held prisoner in a Chinese fortune cookie factory! !” ?? If you’d like to share this post with others, please click Tweet or Facebook or one of the other Share buttons. From Hokey To Hip: Animated GIF Goes To Hollywood!! Hey, We Can’t All Win Beauty Contests! Fortune cookies provide both laughs and insight. Thank you for looking at the funny insights of fortune cookies. Love your art work! I do eat the cookie when I crack open a fortune cookie. Otherwise I won’t bother to touch the cookie to break it. I don’t like wasting food just for my own curiosity…especially when 1 fortune cookie is harmless. You could illustrate more fortunes. 😀 Makes a great T-shirt …for a group, etc. Glad you enjoyed the post, Jean, and thanks for your comment! Funny, not being able to finish a Chinese restaurant meal. 😀 You need to invite more people to those restaurant meals…but then that might mean more shared food dishes. 🙂 I know someone whose brother produced a documentary film on their family restaurant’s fortune cookie making machine here locally. The film was aired nationally. 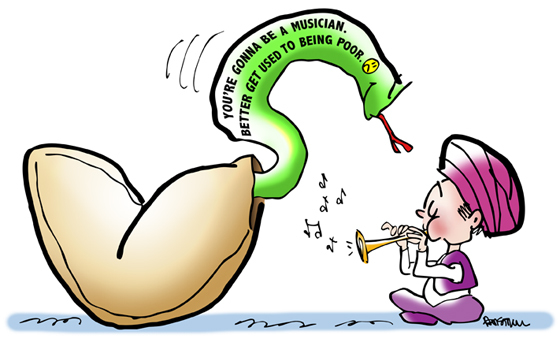 Love the first cartoon & this fortune – “14. You don’t get harmony when everyone sings the same note.” Thanks for the fun post! Nice to see you, many thanks for your kind comment! What am I missing, I just don’t get it? Q: Why did the ship sink? A: Watermelon. Mark … I love fortune cookies. Sorry in my intense craving for a sweet treat, I never considered that I was leaving them homeless. I did have one message that spoke to me and carried it around for years. Sad to say, it’s malingering somewhere in a forgotten wallet. I love your message #9.”People enjoy having you around. Appreciate this.” Wouldn’t we all want to receive – and believe – this message? I know I would. You’re absolutely right about #9. It’s hard to imagine a more uplifting affirmation. And I think it’s a common truth. There are so many people I, personally, enjoy having around– like you, for example! Guess it’s another case of how we chase after things, never stopping to think about the tremendous riches we already enjoy– like folks just being glad we’re around. Another vote for #9! It was one of my favorites, too. You said it very well: there are many people who simply don’t give themselves enough credit. They think they have to do something grand in order to be seen as a worthy person. They fail to see how much they enrich others’ lives just by “being around,” being present in their lives, even if it’s only in a small way. Un autre vote pour le n ° 9! Il était l’un de mes favoris, aussi. Vous avez très bien dit: il ya beaucoup de gens qui ne se donnent tout simplement pas assez de crédit. Ils pensent qu’ils ont à faire quelque chose de grand pour être vu comme une personne digne. Ils ne parviennent pas à voir combien ils enrichissent la vie des autres tout simplement par “être autour,” étant présent dans leur vie, même si elle est seulement dans un petit chemin. Exactly, the little things are the ones with the most importance! aaaw thank you it’s adorable, but it’s especially because you’re a great person and artist that it is that way! You are much more amazing! Those compliments are well deserved, and they aren’t even enough to describe you well, so let’s make that alarm ring! Yes, science is our friend. Whenever I need a second opinion, I always consult a subatomic particle! If the particle is French, so much the better!! Oui, la science est notre ami. Chaque fois que je besoin d’un deuxième avis, je consulte toujours une particule subatomique! Si la particule est le français, tant mieux!! The best thing with science, well, also with art and pretty much everything, is that it’s universal! No distinction would it be french or english or american or etc! Well then let’s put those piles in their houses, we’ll try not to eat them! Consult consult my dear sherlock, hope you’ll do well! I liked what you say, especially Section 9, it’s nice to be around people like you, Mark, that make us think and laugh. A hug! Now I see approach your boat with a big hug, from the window of my office! I knew you had to be close to the docks so you could ship your wonderful stories to your fans all over the world. We wait for them with breathless anticipation. I think I see one coming over the horizon now… hooray! Yo sabía que tenía que estar cerca de los muelles por lo que podría enviar sus historias maravillosas a sus fans de todo el mundo. Os esperamos con anticipación sin aliento. Creo que lo veo venir en el horizonte ahora … ¡hurra! 🙂 ¡¡Muchos, muchos, muchos abrazos y besos!! ¡Un barco lleno de abrazos y besos para ti, Mark! This is one of your best posts ever! The fortunes you chose are so much better than any I’ve ever got! Yes, I always eat the cookie, and there are some good cookies and some not so good ones. Fortune cookies dipped in chocolate… what a mouth-watering concept! It would certainly help them go down a lot easier, too! Thank you for that delicious and therapeutic comment!! Haaahaaa!!!!!!!!!!! Can’t select a fav here; the entire post is wonderful! But #16 spoke to me most eloquently because my “mind-picture” of fortune cookies (when I think of them but don’t see them in person) always turns them into pale snails dragging tiny, piquant banners in their wake. Like the planes that trail ad banners behind them over the beach and fairs, etc.? You are, of course, justly famous for your imagination, my dear Robin, and that was certainly a dramatic example– I shall never be able to look at fortune cookies quite the same way again!! I was struck by Fortune #2 as well: “Beauty is simply beauty. Originality is magical.” Sunsets are a good example. They’re gorgeous, but much the same. Once in awhile you get one with dramatic cloud effects and colors– special, but you know you’ve seen others like it. Hmmm, you must be right! I did wonder what those things were – those circular bread-based products with various chopped foods placed on top… You mean they aren’t a new Chinese restaurant delicacy?? We don’t have fortune cookies in India,but this is super funny! Your cookie’s angst is hilarious!!! 🙂 Just curious – is the art behind the fortune-ate cookie a Freudian slip or just a brilliant artist depicting what everyday people neglect to see? In India, I had the good fortune (and still do, here in TO) of eating Indo-Chinese food aka Hakka cuisine. With or without fortune cookies, this delish, yummylicious, searing hot (Chilli Chicken, anyone?) Chainese food delivers the kind of MSG that makes me sweat and smile all at once! !